How Swami Vivekananda can help in IAS Preparation? The IAS aspirants are generally come out of their comfortable homes and start preparation for the IAS Exam. Uncertainty prevails in the whole process of IAS Exam, to overcome this uncertainty and stress, the IAS aspirants follows various Gurus and Icons. Swami Vivekananda is the youth Icon of India and the National youth day is celebrated on his birthday that is on 12 January each year. His simple living and internalisation principles help the IAS aspirants in becoming the IAS Officer. 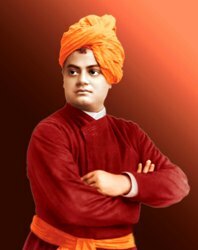 Swami Vivekananda toured all over India and to various other places in abroad in much hardship, suffering and even personal humiliation as an itinerant monk in the last decade of the 19th century. Swami Vivekananda denounced concepts like Karma Yoga, Bhakti etc. and term them as“old-fashioned”, “esoteric” or “mere rhetoric” He emphasized on nationalism, new principles of morality and ethics and spiritual humanism. An IAS aspirant has all the right reasons to follow Swami Vivekananda's teachings, his life lessons and inculcate the concepts he propagated; as the former too undergoes much hardship, suffering and even personal humiliation. Many a times an IAS aspirant is considered to be amonk involved into meditation who wants to overcome his “old-fashioned”, “esoteric” or “mere rhetoric” concepts, ideas, understandings and methods to new principles of studies, new ethos of compassion for the state of the country and spiritual humanism to instill a zeal to serve the nation (a new nationalism). In light of the above paragraph, following paragraphs discusses various teachings of Vivekananda which one can learn for IAS preparation. "You cannot believe in God until you believe in yourself"
Apart from the persistent studies, there are certain values an IAS aspirant must believe to attain success in Civil Services Examination. Confidence and self belief is among the most important of those values. At the same time, reliance and faith on an outer force like a coaching institute, study materials or even god would be futile until a student work persistently on his own and believing more on his skills. "God helps those, who help themselves" lucidly defines the context. "Arise! Awake! and stop not until the goal is reached"
Preparing for Civil Services is considered to be very ardent and humongous task. It requires a lot of continuous, consistent and devoted effort over a long time for becoming successful in this examination. One must not feel tired and keep on making all the efforts with utmost devotion for their studies till he has succeeded in becoming IAS officer. One should remain arisen, awakened and aware till the goal has been accomplished. How to create an effective timetable for IAS Preparation? IAS preparation requires a lot of analysis of concepts, thinking of ideas and understanding of affairs going around. An aspirant must inculcate and infuse the methods, by which he would learn to analyze, think and understand. There are plethoras of ways and means to prepare for this exam. However, one must select and devise his own plan by meticulously planning. There are enormous study materials, coaching institutes andguidance available, however these are superseded by self studies. There cannot be a better teacher than the individual himself. Owing to the long gestation period of the Civil Services Examination preparation, an aspirant goes through many ups and downs in his life. A lot of struggle, sufferings, and hardships are inflicted upon him during this course of studies. However, the comfort, pleasant ambience and easy life are materialistic. These are not sustainable. The success, which comes in the form of truth as the fruits of hard work will always last. The process of attainingthis success however, may prove to be dearly. But, once attained this success will far outweigh the enormous efforts put in. The uncertainty of success always haunts an IAS aspirant throughout his preparations. This very human tendency of anticipating the fruit, one would be getting by putting the enormous effort worries him, tortures him and unstabilizes him. It is this context, which can be well tackled by famous verses of Geeta, i.e. "कर्मण्येवाधिकारस्ते मा फलेषु कदाचन। मा कर्मफलहेतुर्भूर्मा ते सङ्गोऽस्त्वकर्मणि॥". You have the right to perform your actions, but you are not entitled to the fruits of the actions. Prepare hard, study a lot and put in as much as you can, the result will always be positive. However, the time and efforts should not be wasted in dreaming about the success at this point of time. The devotion with utmost honesty towards one's study is one of the most critical factor in bettering one's chance to attain success in the Civil Services Examination. It is not mandatory to study for most of the time of the day. Even persistent studies of 10-12 hours will suffice for this examination. However, this study should be done religiously, as if nothing else exists at the moment other than one's studies. This concentration will imbibe the knowledge in one's brain in sustainable manner. It is critically important for aspirants to inculcate the values and virtues important for an IAS officer. During the course of preparation and studies an aspirant gets to know the reality of state of affairs of our country. In spite of being theoretical and bookish in nature, the aspirant gets aware of plethora of problems engulfing the society, environment and the human race. The students preparing for Civil Services Examination should therefore mould themselves as someone who can give solutions, who can be compassionate, who can be tolerant and who can be generous. Moreover, these qualities are well tested in the papers of essays and ethics. Many a times, even the Personality Test reveals such traits of a candidate. As the Vivekanada used to say "Whatever you think, that you will be. If you think yourselves weak, weak you will be; if you think yourselves strong, strong you will be." An IAS aspirant must think of himself as an IAS officer in order to be one. However, while thinking, he must imbibe, instil and inculcate the ideal qualities necessary for an IAS officer to serve the nation.